Locking file chest holds letter-size or legal-size, hanging file folders with built-in rails. Double combination lock provides security. 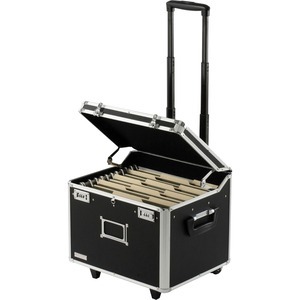 File chest rolls easily on telescoping handle and heavy-duty wheels. Use the handles on the sides for easy carrying. Internal dimensions are 15-1/4"" wide x 12-1/4"" deep x 11-3/10"" high.